The name Anne derives from the Hebrew, Hannah, meaning ‘Grace’. Saint Anne was born in Bethlehem and became the wife of Saint Joachim from Nazareth, in Galilee. Joachim was a shepherd, given the responsibility of supplying sheep for the temple’s sacrifices in Jerusalem. They were both of the royal House of David, and their lives were wholly occupied in prayer and good works. One thing only was lacking in their twenty years of marriage - they were childless, and this was held as a bitter misfortune among the Jews. Joachim is said to have fasted in the desert, in order to plead with God for a child. After a time of fasting, an angel appeared, assuring him that he and Anne would be given a child, whom they would name Mary and dedicate to God. 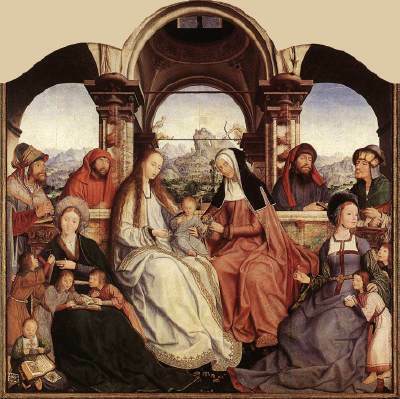 The St Anne altarpiece, now in Brussels. This triptych dates from 1507-1508, and was commissioned by the Confraternity of St Anne for their chapel in St Peter's church in Leuven. The central panel shows the Virgin, the Holy Child and St Anne, with Mary the mother of James and Mary Salome sitting in the foreground with their children. Eventually, and through grace, when Anne was growing old, Mary was born. She was truly regarded as a child of God, and with the birth of Mary, the elderly Anne began a new life. She watched her every movement with reverent tenderness, and felt herself sanctified by the presence of her immaculate child. But she had vowed her daughter to God, and, when old enough, Mary had also consecrated herself to him. Anne gave her back. Mary was three years old when Anne and Joachim led her up the Temple steps, saw her pass by herself into the inner sanctuary, where she spent much of her childhood. When Mary was fourteen, they betrothed her to Joseph of Nazareth and Mary’s story continues with the birth of Jesus. Thus, Anne was left childless in her lone old age, and deprived of her purest earthly joy just when she needed it most. In 550 AD, a church was built in honour of Saint Anne in Jerusalem, near where she lived with Joachim and Mary. 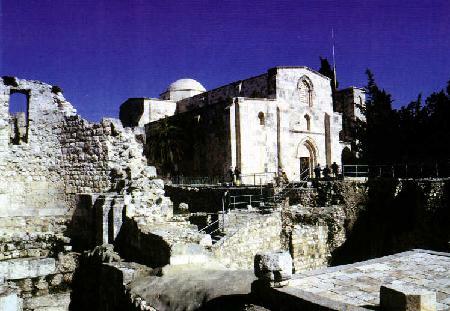 Here is the present day church and ruins in Jerusalem. Her feast day is July 26th.